The Art Gallery of New South Wales is pleased to announce young Australian artist Alice Couttoupes is the recipient of the 2018 Eva Breuer Travelling Art Scholarship. As the recipient of the 2018 Eva Breuer Travelling Art Scholarship, Couttoupes will take up a three-month residency at the Dr Denise Hickey Memorial Studio in Paris. The scholarship awards Couttoupes a $25,000 stipend for living and travel expenses associated with the residency. Denise Mimmocchi, the Gallery’s senior curator of Australian art and member of the scholarship judging panel, said that international residencies are of enormous value to young artists. “The Art Gallery of NSW is delighted to partner with the Eva and Tom Breuer Foundation to offer this fantastic scholarship for young female Australian artists,” Mimmocchi said. “The Eva Breuer Travelling Art Scholarship will be an opportunity for Alice to make new work within a vibrant artist community in Paris. The judges were thoroughly impressed by her application and we are certain this will a very rewarding experience for Alice,” Mimmocchi added. Based in Dulwich Hill NSW, Couttoupes works primarily with clay in both its vitrified and raw state. Her work focuses on an exploration of the sociocultural and political ideas that inform our interaction with nature. “In Paris I plan to examine the trope of ‘mastery over nature’ by looking at French formal garden design – such as Versailles – as a socially and culturally symbolic space. Control and surveillance of nature was a prominent feature of French formal gardens, and that is what I intend to explore and respond to in my new work,” said Couttoupes. The Eva and Tom Breuer Foundation established the scholarship three years ago, in collaboration with the Art Gallery of NSW, to support young Australian female artists for the purpose of travel to and study in Paris. The scholarship commemorates the late Eva Breuer, one of Australia’s most loved and prolific art dealers who made a significant contribution to Australian art for over three decades. The announcement of the Eva Breuer Travelling Art Scholarship is made each year at a special event at the Gallery that brings together the family and close friends of Eva Breuer, in remembrance and celebration of her life. The recipient of the scholarship is chosen from one of the winners of the Art Gallery of New South Wales’ existing residency scholarships that are awarded to up to ten Australian artists each year. 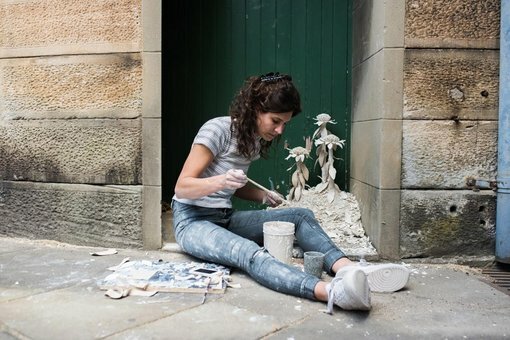 Recipients of the scholarships stay at one of two of the Art Gallery of NSW studios at the Cité Internationale des Arts in Paris – either two months at the Moya Dyring Memorial Studio or three months at the Dr Denise Hickey Memorial Studio. The Eva Breuer Scholarship provides the winning artist, a female under the age of 35, a $25,000 stipend for travel and living expenses associated with their residency scholarship.